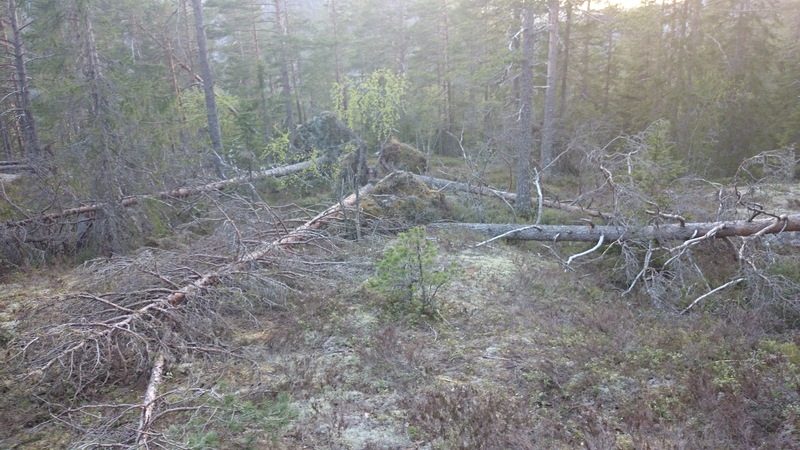 The recent years have been very windy and some badly located clear-cuts have made the forests even more prone to wind damage. 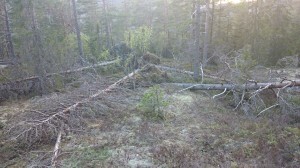 This winter a lot of trees fell in our area. Some species love windfall, the woodpeckers can find a lot of grubs in the dead trees and the moose eats their foliage while it’s still fresh, but to most animals too much of them can be a problem. The trees restricts movement for large herbivores and shades out a lot of the underbrush. The dead needles (if the tree is conifer) acidifies the soil, increasing the likelihood of a lot of spruce colonizing where the tree is laying, creating a long term problem of less sunlight reaching the forest floor. Native Americans in parts of Canada used to burn areas with a lot of windfall, since they didn’t need that much timber and didn’t necessarily have the tools for taking care of the quantity. They burnt the area 2-3 years in a row and then let it either regenerate naturally into woodland or they’d keep it open as a meadow by burning it every year. We normally can’t take the luxury or risk of burning windfall areas. 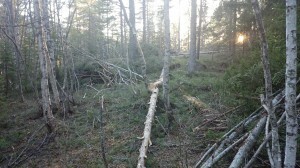 If taken the same year the timber is just as good as if conventionally harvested. My brother does carpentry and traditional log cabin building and saws his own materials, making this source of timber very welcome. Usually we avoid cutting large trees, in particular Scotch pine, which can live for centuries. Windfall is fairly random in what kind of sized timber it provides, but enough of the big ones comes down to cover his need. As we are working in the area, we also thin/remove small spruces and birches, making sure to save rarer species like alder or rowan. All the branches and saplings are piled into heaps. Left over the winter they provide excellent habitat for mice and other small animals. In following spring we burn the heaps.